Located on floors 29 through 46, the furnished residences available for rent at AKA University City rise to the top of the Philadelphia skyline. Boasting 10-foot ceilings and the city’s most spectacular panoramic views, the building, conceived by internationally-renowned designer and architect Piero Lissoni, sets the standard for stylish ultra-luxury living in Philadelphia. Units feature wide-plank Italian white oak flooring, custom-designed furniture, Italian cabinetry, custom stainless-steel appliances, and complimentary high-speed Internet + WiFi. Natural light streams throughout spacious living and dining areas kept immaculate by available meticulous housekeeping services. The entire 28th floor features lifestyle-enhancing amenities dedicated to the wellness and enjoyment of building residents. A 72-foot indoor “pool in the sky” boasts floor to ceiling windows showering bountiful natural light on the contemporary lounge-style seating provided by a.lounge, AKA’s private bar and lounge. A modern Philadelphia fitness center with state-of-the-art Technogym equipment, yoga/stretching area, private treatment room, and private locker room provides residents with everything needed to sculpt their ideal physical shape. Other amenities include a landscaped terrace with cozy fire pits, private dining, conference areas with breathtaking views, 3-D indoor golf simulator, as well as a.cinema, a private theater boasting curated screenings and an extensive film library. 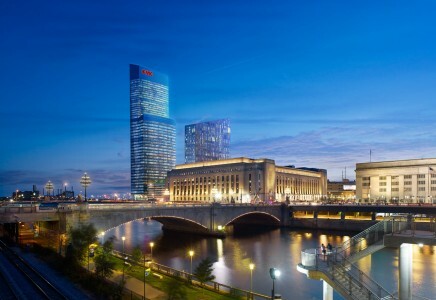 The building also boasts Cira Green, a stunning elevated one-acre urban park designed for relaxation, meditation, and enjoying live cultural events throughout the year. AKA will soon include exciting retail offerings and a highly-anticipated addition to Philadelphia’s burgeoning culinary scene, an indoor/outdoor restaurant and bar from the visionaries behind New York City’s Michelin-starred Rebelle.